ЕГЭ устная часть. Тренировочные тесты. Мильруд Р.П. A stranger stands next to you at a bus stop. You wait in line at the bank. Your teacher is late for class. What can you do with this time? You can make small talk. When you meet a new person, you can have a short, simple conversation. This is small talk. It’s a way to get to know someone. Some of the most popular small talk topics include the weather, sports, family, and work. These are all universaltopics that anyone can talk about. Some people think that small talk is difficult. They feel shy, or they don’t feel prepared to talk to strangers. Other people even think that small talk is cliche. They prefer to have more meaningful conversations, and they don’t want to talk about simple things like the weather. But small talk is a great way to meet new friends and learn new things. Sometimes, all you need is a smile to begin a conversation. Jessica is going to go on a date with her secret admirer, but she is nervous. Watch today’s English lesson to hear Sara’s small talk ideas. Sara_R: Marni said you have a secret admirer. Jessica: Someone has been leaving me gifts. I’m thinking about meeting him for coffee this Friday. Jessica: I am so bad at small talk. Sara_R: It’s normal to feel shy on a first date. Jessica: Not just on first dates. I am always bad at small talk. I never know what to say to someone who I’ve just met. Sara_R: You can ask him about the weather. Jessica: But that’s so cliche. I want to talk about more meaningful things. Sara_R: I hear what you’re saying. Hey, I have an idea! Make a list before you go of things to ask him about. Sara_R: Ask him about his family. Ask him which countries he’s visited, or if he hasn’t traveled, where he wants to go. Ask about his job. Jessica: But isn’t that kind of boring? Jessica: OK. But will you help me? I want to feel prepared. Sara_R: Of course! Small Talk 101. Tomorrow afternoon? Jessica: Great. Thank you, Sara. Sara_R: I’m happy to do it. Jessica’s secret admirer has been giving her many presents. She tells Sara that she will probably go on a date with him. But she is very nervous about making small talk. She feels like she has nothing to say. Sara gives her some ideas. She suggests talking about the weather, but Jessica wants to have a deeper, meaningful conversation. Sara gives Jessica more ideas, including making a list of topics that she could talk about. Jessica is afraid that these simple topics will be boring and cliche, but Sara says that they are universal and easy for all people to talk about. Jessica wants more help in order to be prepared, so Sara says that she will give her a class on Small Talk 101. Do you like to make small talk with strangers? What is the most interesting thing you learned from small talk? Jessica is telling Sara about her secret admirer. She says, “Someone has been leaving me gifts.” She uses the present perfect progressive. We form the present perfect progressive (sometimes called the “present perfect continuous”) with have/has been + main verb + ing. We use this tense to talk about an on-going action that began in the past, is still in progress, and may continue into the future. For example, you might say, “I have been thinking about getting a new car for weeks.” You first thought of getting a new car weeks ago, you’re currently thinking of getting one, and unless you buy one or decide not to buy one right now, you’ll continue thinking about it. When Jessica says, “Someone has been leaving me gifts,” she uses the present perfect progressive to show that he began leaving gifts in the past, he is still leaving gifts, and he will probably continue to leave gifts. Which is correct, “We have thinking about moving to China,” or, “We have been thinking about moving to China”? Which of these is not a universal small talk topic? Sara does not suggest __. Your friend says, “I hear what you’re saying.” What does this mean? We do not use the present perfect progressive to talk about __. action that takes place once, never or several times He played football every Tuesday. He plays football every Tuesday. He will / is going to play football every Tuesday. actions that happen one after another He played football and then he went home. He plays football and then he goes home. He will play football and then he will go home. state He loved football. He loves football. He will love football. action going on at that moment He was playing football. He is playing football. He will be playing football. actions taking place at the same time He was playing football and she was watching. He is playing football and she is watching. He will be playing football and she will be watching. action taking place before a certain moment in time; emphasises the result He had won five matches until that day. He has won five matches so far. He will have won five matches by then. action taking place before a certain moment in time (and beyond), emphasises the duration He had been playing football for ten years. He has been playing football for ten years. He will have been playing football for ten years. Simple Present A: He speaks. N: He does not speak. Present Progressive A: He is speaking. N: He is not speaking. Simple Past A: He spoke. N: He did not speak. Past Progressive A: He was speaking. N: He was not speaking. Present Perfect Simple A: He has spoken. N: He has not spoken. Present Perfect Progressive A: He has been speaking. N: He has not been speaking. Q: Has he been speaking? Past Perfect Simple A: He had spoken. N: He had not spoken. Past Perfect Progressive A: He had been speaking. N: He had not been speaking. Q: Had he been speaking? Future I Simple A: He will speak. N: He is not going to speak. Future I Progressive A: He will be speaking. N: He will not be speaking. Future II Simple A: He will have spoken. N: He will not have spoken. Q: Will he have spoken? Future II Progressive A: He will have been speaking. N: He will not have been speaking. Q: Will he have been speaking? Conditional I Simple A: He would speak. N: He would not speak. Conditional I Progressive A: He would be speaking. N: He would not be speaking. Q: Would he be speaking? Conditional II Simple A: He would have spoken. N: He would not have spoken. Q: Would he have spoken? Conditional II Progressive A: He would have been speaking. N: He would not have been speaking. Q: Would he have been speaking? A person of New Zealand nationality is a New Zealander. The country's nearest neighbour is Australia, which lies more than 1,600 km northwest of New Zealand. New Zealand comprises two main islands (North Island and South Island) and a number of small islands, some of which are hundreds of kilometres from the main islands. A person of Australian nationality is an Australian. Australia is not only a country but also the smallest continent. Accompany us on our virtual Tour around Ireland. We've picked the nicest places on the Emerald Isle for you to explore. A person of Irish nationality is an Irishman or an Irishwoman. 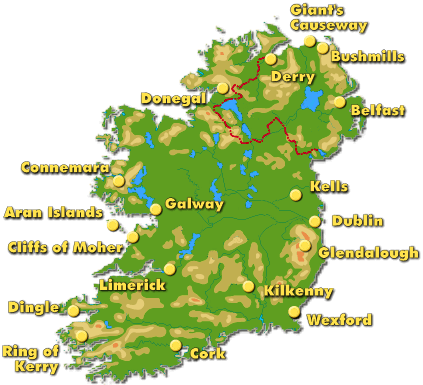 As Ireland is famous for its green countryside, it is also known as the “Emerald Isle” (= green island). На экзамене предлагается отрывок из письма от вашего возможного друга по переписке. В письме содержится некая новость и несколько вопросов, где у вас спрашивают мнения, совета и т.п. Требуется написать письмо-ответ, начиная с вашего краткого обратного адреса в верхнем правом углу, даты под адресом, приветствия и заканчивая прощальной фразой и именем. ответить на все вопросы, заданные в полученном письме, дать совет, выразить своё мнение и т.д. Важно! Требования к объему письма - 100-140 слов (считаются все слова, включая предлоги и артикли). Требования к объему нужно соблюсти обязательно. Допустимое отклонение от заданного объёма составляет 10%. Если в работе будет меньше 90 слов, то задание проверке не подлежит и оценивается в 0 баллов. Не стоит описывать лишние подробности, т.к. если вы напишете более 154 слов, то от начала отсчитают 140 слов и будут оценивать только эту часть письма. Помните, что обязательные повторяемые элементы письма — адрес, обращение (Dear Alice), благодарность за полученное письмо (Thanks for your letter. It was great to hear from you), заключительные фразы (типа Write soon. Best wishes) и ваше имя в конце письма уже составляют около 20 слов. Заучите эти фразы и зрительно запомните схему расположения частей письма. ОЧЕНЬ ВАЖНО! Поскольку в этой части ЕГЭ важно не только содержание, но и форма (layout), то обязательно зрительно запомнить расположение составных частей письма на странице – см. пример ниже. Обращение начинается с Dear, к которому добавляется имя. Обращение пишется не посередине листа, а на его левой стороне, без отступа на красную строку. Не забудьте поставить запятую (а не восклицательный знак) после обращения. Объясните, почему вы пишете это письмо, а также о чем оно будет. Ответьте на вопросы, которые вам задал автор письма в своём послании. В конце письма в новом абзаце задайте адресату вопросы согласно заданию (в разобранном ниже примере это вопросы о новом доме). В конце письма не забудьте написать завершающую фразу Best wishes(С наилучшими пожеланиями) или Love (Целую) на отдельной строке. Не забудьте поставить запятую после Best wishesили Love. На отдельной строке после завершающей фразы подпишите письмо — напишите своё имя. Можно обойтись кратким адресом – улицей и городом. In June I stayed at home because I had exams at school. Luckily the weather was nice and warm and at the weekend my parents and I went to our country house. We went sunbathing and swimming in the lake near there. Перед выполнением этой части экзамена внимательно прочитайте отрывок из письма от вашего предполагаемого друга и задание к нему. Задание поможет вам понять, что от вас требуется. Подчеркните содержащиеся в отрывке вопросы, на которые вы должны ответить в первой половине вашего письма. Определите для себя тему вопросов, которые вы должны задать во второй части вашего письма. You have 20 minutes to do this task. …In Great Britain most young people want to become independent from their parents as soon as possible. Could you tell me what you and your friends think about not relying on your parents? Are you ready to leave your family immediately after you finish school? Is it easy to rent a house or an apartment for students in Russia? Write a letter to Tom. Write 100 – 140 words. Remember the rules of letter writing. В черновике напишите план первой половины вашего письма. Например, в демоверсии ЕГЭ за 2009 год нужно дать ответ на вопрос, насколько вы полагаетесь на помощь родителей. Обязательно обоснуйте ваш ответ. В письме всегда есть подсказки. В данном случае, ответ на вопрос «сможете ли вы обеспечить себя жильём» подскажет вам, насколько вы готовы начать самостоятельную жизнь. Помните, что от вас не требуется писать про себя правду и ничего кроме правды. Не стесняйтесь фантазировать. Главное, вы должны предоставить достаточную порцию вашей письменной речи на английском языке, на основе которой можно сделать умозаключение о степени владения вами навыками написания личного письма. Набросайте план второй части вашего письма. Например, при выполнении задания демоверсии 2009 года вспомните, что вы знаете о Шотландии (Loch Ness Monster, the Edinburgh arts festival, the Scottish accent, etc.). Можно задать вопросы на эти темы, а также любые стандартные вопросы о какой-либо поездке вообще: Did you have a good time? What was the weather like? Did you do a lot of sightseeing? Зрительно восстановите в памяти макет письма. Начните писать, соблюдая правила написания личного письма (см. выше). Закончив ваше письмо, обязательно проверьте его на наличие орфографических или грамматических ошибок. Если вы не уверены в правильности написания какого-либо слова, замените его на другое, в написании которого вы уверены.